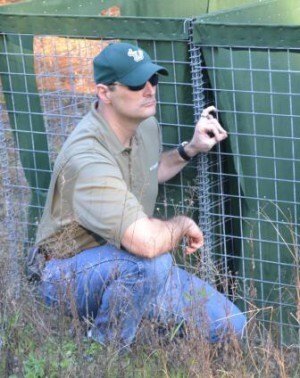 Jon Croci is a State of Florida employee with the Florida Department of Military Affairs (DMA), serving as Environmental Specialist III at the Camp Blanding Joint Training Center. He was submitted for the Governor’s Spotlight recognition program. According to the Dept. of Military Affairs human resources manager, Croci consistently and exceptionally performs his duties as supervisor to the Camp Blanding Forestry Environmental section in a manner worth emulating. Jon Croci, Compliance Supervisor, reviews the Walter Reed Army Institute of Research entomological project on barriers and the control of potential diseases. Croci’s environmental expertise, as well as a consistent display of outstanding leadership abilities and work ethic are indicative of the great asset he is to the Camp Blanding Environmental Section. He and members of his environmental team (representing the Florida National Guard team) were announced in October 2013 of their third place finish, out of 54 states and territories, for the 2013 Federal Environmental Quality-Non-Industrial Installation Award, in particular for their Pest Management program. He has proven himself, time after time, providing exceptional service with dedication and loyalty expected by the citizens of the State of Florida, the Florida National Guard and the Department of Military Affairs. About the Florida Department of Military Affairs. The Florida Department of Military Affairs provides management oversight of the Florida National Guard, and provides units and personnel ready to support national security objectives; to protect the public safety of citizens; and to contribute to national, state and community programs that add value to the United States of America and to the State of Florida. The Department of Military Affairs, a state agency created by Chapter 250, Florida Statutes, oversees and provides administrative support to the Florida National Guard. Directly responsive to the Governor of Florida, the Department and the Florida National Guard together operate within the policy guidance and fiscal framework of both federal and state authorities.